LAWRENCE, Kan. – A who’s who of Jayhawk celebrities will return to Lawrence to participate in the 10th Annual Rock Chalk Roundball Classic on Thursday, June 14, at Lawrence Free State High School. 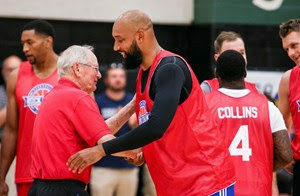 Former Kansas men’s and women’s basketball and football players, along with other KU luminaries, will play in a friendly basketball game which raises money each year for local children fighting cancer and other life-altering diseases. Celebrating its 10th year, the 2018 Rock Chalk Roundball Classic has grown to a three-day event adding a VIP dinner on Friday, June 15, and Celebrity Golf Tournament Saturday, June 16. Both the Friday and Saturday activities will be at the Jayhawk Club in Lawrence. Tickets are still available for the Thursday basketball game for $10 and can be purchased in advance at the 23rd St. Brewery in Lawrence, Jersey Mike’s in Topeka (718 S Kansas Ave and 2121 SW Wanamaker Rd.) and the KC Soda Company with locations at Legends and City Market. Doors open at Free State High School at 5:30 p.m., with the event starting at 7 p.m.
Friday’s VIP dinner is sold out but there is space available for the Celebrity Golf Tournament at the Jayhawk Club Golf Course on Saturday at 8:30 a.m. Each team will have one KU celebrity join them for the day, while other KU greats will be showing up throughout the course of play. For more information one can go to: www.rockchalkroundballclassic.com.